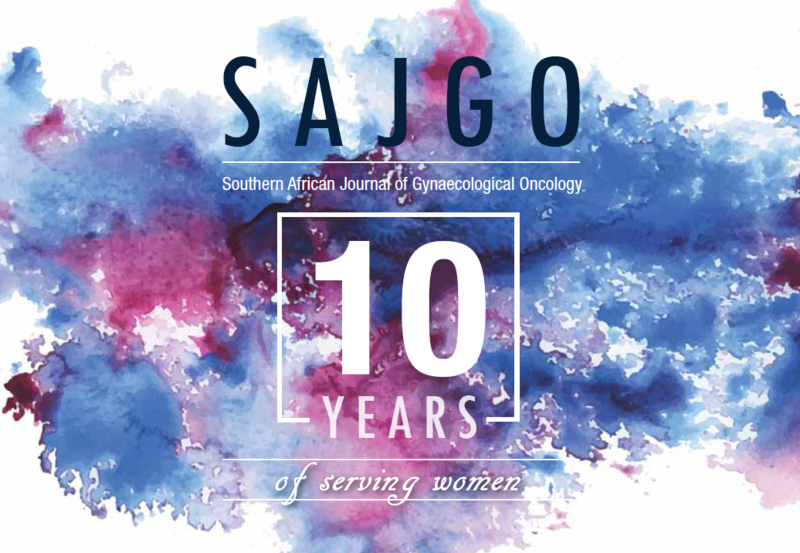 The Southern African Journal of Gynaecological Oncology (SAJGO) is the official journal of the South African Society of Gynaecologic Oncology (SASGO) and the South African Society of Clinical and Radiation Oncology (SASCRO). The Journal aims to be the prime journal on women’s cancer for local healthcare workers and gynaecologists, focusing on all aspects of cancer prevention, detection, diagnosis and treatment. 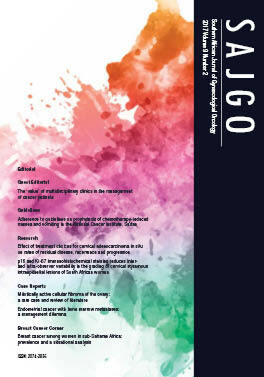 The SAJGO is also a specialist journal catering for sub-specialist gynaecologic oncologists, for other specialists with a specific interest in breast and gynaecologic cancer, including medical oncologists, radiation oncologists, surgeons, radiologists, pathologists, geneticists, specialised nurses and research scientists. The Journal supports the vision of SASGO, namely to promote excellence in gynaecologic cancer care and will also aim to promote excellence in breast cancer care. The Journal also supports the mission of the society and will assist SASGO with all aspects of communication, training, advocacy and by supporting and stimulating local research. ALL ABOUT DRY MOUTH What is it, what causes it and how can symptoms be relieved? We use our mouths every day to eat, smile, speak, and more. Saliva is important to maintain a healthy mouth. When the quantity and quality of saliva decreases, oral diseases can develop very quickly. Saliva also washes your teeth providing minerals for repair, and helps prevent bacteria, viruses and fungi from causing tooth decay and gum disease. To counter the exponential rise in medical malpractice claims in recent years, Genoa Underwriting Managers and KZN based Safire Insurance Company have launched a specialised Medical Malpractice Insurance product that will completely change the way local doctors and specialists manage risk. The Herpes simplex viruses can be categorised into two types, namely the herpes type 1 (HSV-1) more commonly known as oral herpes (fever blisters or cold sores) and herpes type 2 (HSV-2), known as genital herpes. An interesting study by The American Optometric Association notes that vitamin C benefits include slowing the progression of age-related macular degeneration (AMD) which is the number one cause of blindness as we get older and will help to preserve sharp vision. Scientific evidence suggests vitamin C lowers the risk of developing cataracts of which risk factors are smoking, diabetes and steroid use which can deplete the eye’s lens of vitamin C.